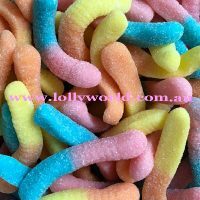 Sour Worms are one of the most sour of our lollies and are also Gluten Free. Buy in 100g, 400g or 1kg, sour worms are great fun in cup cakes and also Halloween. Enjoy sour worms from Lollyworld today.